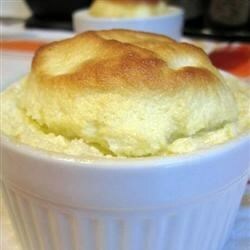 "An easy recipe for quick lemon souffles that never fails. Lemon curd is topped with a lemony souffle and baked into a light dessert." Whisk the egg in a medium saucepan, and mix in the 1 lemon's zest and juice, 1/4 cup sugar and cornstarch. Set over medium heat, and cook stirring constantly until the mixture thickens. Reduce heat to low, and continue whisking for another minute. Remove from the heat and stir in the butter. Divide between four 6 or 8 ounce ramekins. Set aside. Place the ramekins onto a baking sheet, and place in the preheated oven. Bake for 15 to 17 minutes, until puffed and golden brown. Let cool for about 5 minutes before serving. This is really good for a lemon lover. Loved it! Will make again soon! It tasted like sweet eggs. Extremely sweet and very eggy. I find that the recipes with allrecipe require too much sugar and liquid which leaves them too sweet and soggy. After I removed the ramekins from the oven and waited the 5 min. cool time, they cracked and started to fall. The lemon curd I thought was essential as the souffle itself was light and boring.